Being a veteran owned business, we here at KFE Brake Systems appreciates and supports America’s troops. For those who are willing to put their life on the line to give us our way of life, we want to give a big thanks to you. November 2017, KFE Brake Systems was able to help Paralyzed Veterans America continue their work in helping veterans in the armed forces who have experienced spinal cord injury or dysfunction. KFE Brake Systems have pledged and donated $300.00 to the Paralyzed Veterans of America. 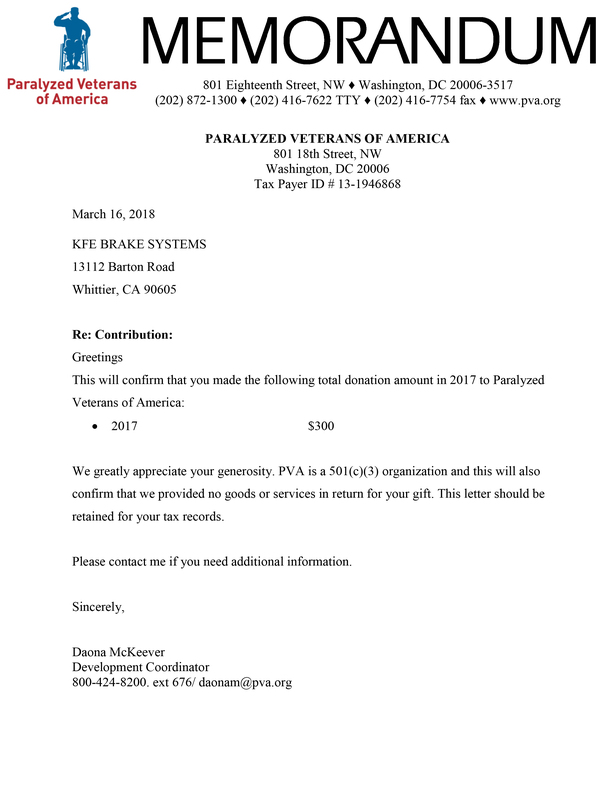 We hope that this small donation will help PVA continue their work in helping those who have sacrificed to protect our freedoms. KFE Brake Systems hopes that everyone who associates with our business, our suppliers, vendors, and customers to take time to thank, help, and give to those who have voluntarily put their lives on the line, in all corners of the globe to protect our freedom and interests. Thank you Paralyzed Veterans of America! Thank you to our Troops! And thank you to our Veterans!